Alaska Marine Lines, an Alaska marine transportation company, is expanding its service from Seattle and Anchorage to the Arctic Region in 2019. Bowhead Transport will provide the destination services at the North Slope villages of Point Hope, Point Lay, Wainwright, Utqiagvik (Barrow), and Kaktovik. 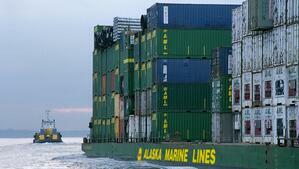 Alaska Marine Lines will also service Deadhorse with its two annual sealifts. Bowhead, thru its teaming agreement with Alaska Marine Lines, will continue to participate in the door-to-shore service to the Arctic that it initiated over 30 years ago. The new stops will be added to Alaska Marine Lines’ many ports of call, joining the major hubs of Naknek, Dillingham, Nome, Bethel and Kotzebue and more than 65 villages along the coast of Western Alaska. For more information or to book a shipment, contact Alaska Marine Lines at 800-426-3113 or westernakcs@lynden.com.